DAYTON (Ohio), June 5, 2018 — When Real Change Dayton launched in June 2017, it began as a public awareness campaign to call to attention the vast offerings local social service agencies and nonprofit organizations supply the region. 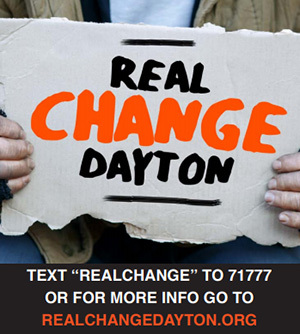 Real Change Dayton sought to remind people that while they may be approached by individuals seeking money, the best way to ensure long-term, sustainable life changes that truly lift people out of poverty, addiction, underemployment, and the other root causes for panhandling is to support local charities, social service agencies, and nonprofit organizations that tackle those specific issues. This week, those groups are celebrated during The Square Is Where as the first-ever Real Change Challenge. In addition to donated underwear, monetary donations may be made to St. Vincent’s, or using the Real Change Dayton collection infrastructure, including the website, www.RealChangeDayton.org, which provides links to each Real Change Dayton partner organization so people can learn more about the services provided, and how donations to these organizations go further than contributing directly to an individual. There is also a text-to-give campaign (text “REALCHANGE” to 71777), and brightly colored wrapped meters where people can make immediate monetary contributions, if they so desire. Partner agencies include United Way of Greater Dayton, City of Dayton, Montgomery County Health and Human Services Department, and the Downtown Dayton Partnership, with support from Homefull, St. Vincent de Paul, Goodwill Easter Seals, and other local nonprofits. Each organization represented in the coalition contributes to the Dayton region’s net of social services and specialized care options for at-risk populations. On Friday, June 8, representatives from St. Vincent de Paul, United Way, Homefull, and others will be at Courthouse Square during the free lunchtime programming (The Square is Where, weekdays from 11:30 to 1 p.m.). St. Vincent will be presented with the total donated items and money collected in the first year of Real Change Dayton.